SFO Plans to Eliminate Short Line. By Mark Gruberg, UTW. After months of meetings with drivers and more months of inaction, SFO management is pushing forward with a plan to do away with the taxi short line. The Airport Commission will vote on the proposal on Tuesday, Dec. 7. § The short line will be eliminated as of Feb. 1, except for CNG cabs. § Drivers will pay $4 for all trips. § Drivers will be allowed to pass through $3 to the passenger, instead of the $2 now allowed. § There will be a minimum fare of $17, including the $3 pass-through. Interestingly, CNG cabs will still be allowed one short trip per shift under the plan. The airport plans to close the door on new entries into the CNG short program early next year, but cabs currently in the program will have short line privileges as long as they are on the road. The airport’s plan is similar to one management sought to impose last spring. It was put on hold after dozens of drivers came to an Airport Commission meeting to protest. Under orders from the commission, management convened a committee of drivers to discuss plans for dealing with the short line. While these meetings were in progress over the spring and summer, I talked to hundreds of drivers at the airport. The great majority wanted to keep some form of the short. The reasons are clear. Cab drivers earn their living from day to day. Gates must be paid at the end of the shift, or the driver will be held out of service. The rent comes due, or the long-term lease, or personal and family necessities that won’t wait. Say a driver pays his $4, spends two hours in the lot and gets a short for $20, including tip. He can go back into the taxi lot, pay another $4, perhaps wait another two hours, and maybe get another short. Or, he can deadhead back to the city, meaning he’s invested 2 ½ or 3 hours of his time for $16. None of that is his. His gates and gas for that slice of time are way more than he’s made. Management says the time-based short encourages speeding and is open to cheating. At the airport meetings drivers acknowledged that there are problems with the current system, and presented ideas to deal with them in ways that would allow for keeping the short. Among these ideas were several variations on the theme of a distance-based short. United Taxicab Workers proposed a system similar to the one used at all the New York airports. There, a starter asks passengers where they are going and issues a ticket to the driver if the destination is a short. The driver has up to 90 minutes to return to the airport. The system has been employed successfully for a number of years. A GPS-based short system was also discussed. Most driver reps agreed that this would ultimately be the best solution. But management was cool to the idea, saying it presented technical problems. They say they haven’t discarded the notion, but they’ve shown little inclination to pursue it. They also dismissed out-of-hand a simple, interim solution of reducing the time limit for a short from 30 minutes to 25 or even 20 minutes. That would eliminate the possibility of making a short from the city. Since most rides from SFO go into San Francisco, most abuses would end instantly -- and at no cost -- allowing time for longer-term solutions to be pursued. SFO's proposal to eliminate shorts. Carl Macmurdo, Medallion Holders' Association. The airport’s “final proposal” came as no surprise. During the months of meetings, airport officials never wavered in their expressed intention to end the short. But their plan is completely untested, and they glibly dismiss the problems it could create for drivers, passengers and the airport itself. For instance, what if drivers, wary of getting a short, simply stop playing the airport in sufficient numbers to ensure a steady flow of cabs? This is especially a danger when both the airport and city are busy. At the final meeting, I proposed the idea of a trial of the airport’s plan. Test it for three months. Survey passengers and drivers on its effects. See whether demand is being met. After a thorough review, the Airport Commission would decide whether it should be continued, changed or scrapped. This conciliatory proposal was tossed aside with the demeaning suggestion that drivers might intentionally subvert the system. Shockingly (at least to me) most of the dozen or so drivers attending the airport meetings supported, or at least did not oppose, the airport’s plan. I’m not going to point fingers at the supporters, but the only attendees who made clear their opposition were myself, Bud Hazelkorn and Tariq Mehmood. If drivers are concerned about the airport’s plans, Tuesday’s Airport Commission meeting will be the last chance to derail it. Sometime in January, the MTA will consider whether to approve the $3 pass-through and the minimum fare, but the airport can eliminate the short line without any further approval. They plan to do so as of Feb. 1. The Airport Commission meeting will take place Tuesday, Dec. 7 at 9 a.m. in City Hall, Room 400. During the course of the Dec. 1 airport meeting, SFO management threw in another zinger. They will soon be re-opening Terminal 2, with American and Virgin America as tenants. 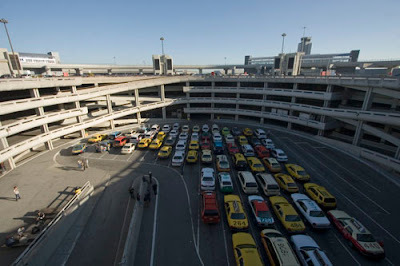 In connection with that move, door-to-door shuttles like SuperShuttle will be moved from upstairs to downstairs at all the terminals, sharing the curb with taxis. They say that no taxi spaces will be lost, but this change will put the shuttles in direct competition with us for passengers exiting from the baggage claim. Not infrequently, the line for cabs is long, especially at Terminal 3. This is not necessarily on account of a lack of cabs. It often happens because the cabs in the taxi lot aren’t dispatched to the pick-up line quickly enough. So passengers have the impression that cabs are scarce, although the lot may in fact be full. Many of those would-be taxi passengers will walk a few steps and take a shuttle. Through no fault of our own, a nice chunk of our business will be gone.